What is the history of Roulette? The exact location and origin of the game of roulette is a bit ambiguous, but we do know who first created the first roulette wheel. In an attempt to discover a wheel of perpetual motion, Blaise Pascal, a French mathematician and scientist, created the first roulette wheel in the mid 1600’s. The ball and rules were introduced in the 1720’s, and by 1796 the game was played very similar to the game of today. The game of Roulette really began to increase in popularity in 1843 when two Germans introduced a wheel that only had a single 0. The original wheels had both a 0 and 00. When word began to spread that this single 0 wheel reduced the house advantage by almost half, popularity for the game began to soar. 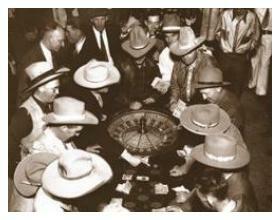 During the 19th century the popularity of roulette began to spread around the world. Interestingly enough the game that spread to America was the double zero game not the more popular single 0 game. Even today the single 0 wheel is known as the European style wheel, and the wheel that contains both the single 0 and double 00 are known as the American wheel. One of the most notable stories in gambling history revolves around roulette. In 1913, at a casino in Monte Carlo, black came up 15 times in a row on the roulette wheel. People began storming the tables to place their money on red. They were under the belief that red had to come up because black had come up 15 times in a row. This is known as the Gambler’s Fallacy. Truth is, the odds of red coming up were still the same. As black came up 20 times in a row, people were doubling and tripling their money insisting that red was due to hit. This lasted an incredible 26 times in a row where black came up over and over again, and people lost millions of dollars in an attempt to cash-in on a sure thing. Roulette is a gambling game enjoyed by millions of people around the world. Much of its popularity comes from its simplicity and the fact that anybody can play without much previous knowledge. Pick a number and hope that the ball lands on it and you will win. Doesn’t get any easier than that! Many people believe that Pascal made a deal with the Devil in his development of the roulette wheel. Add up all the numbers and see what you get. I’ll give you a hint, the first number is 6 and the last number is 6.